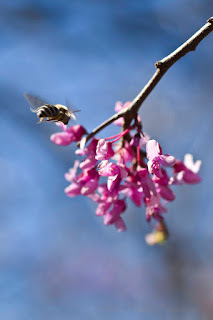 I have been hoping to see bees this Spring but they have been slow in coming. I have seen a Bumble Bee a few times but have yet to get a shot. This past weekend I finally saw what I think is a Honey Bee enjoying the blossoms of the Red Bud trees in my backyard. I was even able to capture it in flight.